Focus is on encouraging team members to think through the various tasks. Only by forming sub-teams and working in parallel can the incredible creations be achieved. With a good understanding of the end goal, this complex project can be broken down to keep the whole team productive and efficient with everyone’s efforts being essential for a successful build. 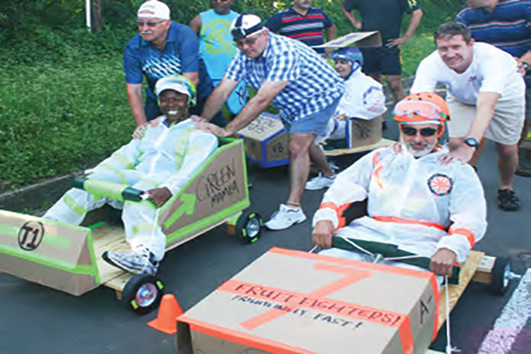 Just like professional racing, our Go-Kart Construction Challenge is about crew and driver. Your group will be split up into smaller racing teams whose goal will be to build a custom concept car for a people-powered race. The first order of business will be to elect a Pit Crew Boss. The Pit Boss will provide overall supervision for this team challenge. Once the team has decided on a theme for their car, the Pit Boss will assign each team member a role. Each team member must work together in their various roles if they are to revel in the winner’s circle. Each team develops a blueprint design that must be approved by Event staff for safety. The concept car must have a chassis and body. Team members must build their race car according to their blueprints. While the car is under construction, other team members will decorate a set of drivers coveralls with the team’s theme. The completed cars are approximately 18” x 48” and hold a driver. Their lucky driver will wear the uniform for the big race: a race that will be team-powered! To fire up the team spirit and prepare their driver for competition, team members will create and perform their very own “Champions’ Chant”. All concept cars must pass a safety inspection before they will be allowed to race. Once inspection is passed, drivers will suit up and prepare for competition. Teams will race against each other and the clock to see who will make it to the final Winner’s Circle. Award medals will be presented for Best Pit Crew, 1st Place Finish and Best Overall Team. Aspects of the program may be modified depending on venue restrictions, program length, and group size. There is plenty of creativity with ‘pimping’ of the cars, and practice makes perfect as the final race is won or lost in the pit stop.